Home » Academics » Schools » School of Science, Engineering and Technology » Faculty » Ian P. Martines, Ph.D.
Ian Martines, Ph.D., joined the Department of Mathematics at St. Mary’s University in 2009 and served as Chair from 2014-2018. As Associate Professor of Mathematics, Martines has served on several University committees including the Tenure and Promotion Revision Committee, the Core Curriculum Review Committee and the Marianist Educational Associates. 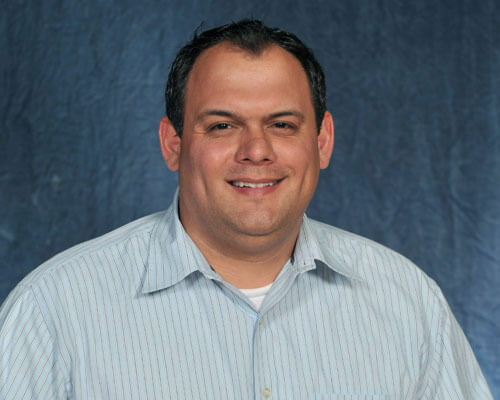 Departmentally, he currently serves as Engineering Mathematics Coordinator and teaches courses in both the Mathematics and Engineering departments. Martines’ scientific research areas include numerical analysis and mathematical ecology with a focus on computational approaches to population modeling. He frequently includes undergraduate students in his research and has mentored more than 40 students in formal undergraduate research programs since 2008. Recently, Martines expanded his research interests to include elements of student success and retention in STEM disciplines.